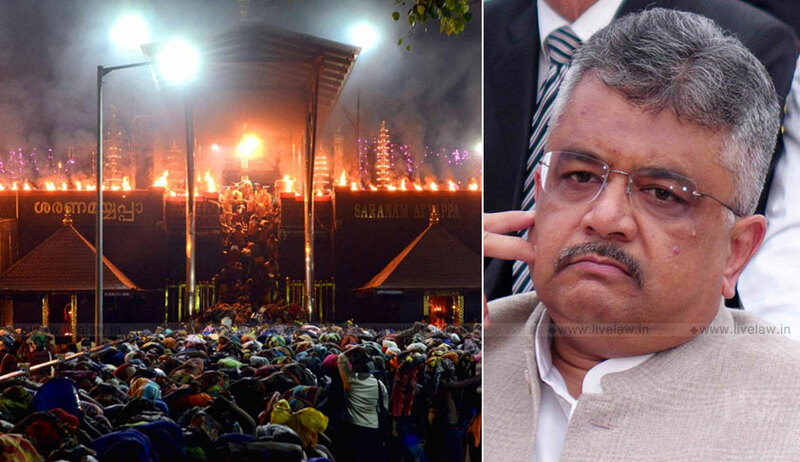 In the midst of ongoing protests against entry of women of all age groups into Sabarimala temple, Solicitor General Tushar Mehta has refused permission for initiating contempt action against those who are allegedly instigating disobedience of the Supreme Court judgment in the case. The petitions had been filed by two women seeking sanction to initiate contempt proceedings against a few people allegedly violating the Supreme Court’s judgment in Indian Young Lawyers Association v. State of Kerala & Ors. One of the petitions was filed by one AV Varsha alleging contempt of court by Mr. Kantararu Rajeevaru, Head Priest of Sabarimala Temple in Kerala, and Mr. P. Ramavarma Raja, Chairman of Trust/Committee that manages the affairs of Pandalam Palace that claims to have historical connection to the Sabarimala Temple and its affairs. Mr. Raja said to have written a letter to Mr. Rajeevaru, directing him to shut down the temple in case of any breach of rituals. Notably, both the individuals had taken a stand against entry of women before the Supreme Court. The writing of the letter now, the petition contended, is a clear violation of the Supreme Court judgment. Another petition was filed by a woman lawyer from Thiruvananthapuram, Geena Kumary against Adv. P.S Sreedharan Pillai, President of the State Committee of Bhartiya Janta Party; Adv. Muraleedharan Unnithan K.G, leader of the Bhartiya Janata Party in Pathanamthitta District, Kerala; and Mr. Kollam Thulasi, a movie artist. It stated that the contemnors have been orchestrating various marches, rallies, social media campaigns wherein calls and speeches are made by the contemnors to resist implementation of the judgment of the Supreme Court. Mr. P.S Sreedharan Pillai was stated to have organized a thousand-strong mob at Nilakkal and nearby areas at the foothill of Sabarimala on October 17, by attacking public property, stopping vehicles that crossed through the road, and attacking women devotees who had arrived to visit Sabarimala. The contempt petition further stated Mr. Kollam Thulasi made highly contumacious remarks by saying that women should be ripped apart; one half should be sent to Delhi and another to the Kerala Chief Minister. According to the petitioner, this was directly in the form of resisting the implementation of the judgment of the Supreme Court. Mr. Muraleedharan Unnithan was indicted for saying that the Constitution should be burned to ground during a protest march. It is the Attorney General for India who is required to provide consent before the contempt petition can be filed in the Supreme Court, as per Part II Section 3(c) of Rules to Regulate Proceedings for Contempt of the Supreme Court, 1975. Attorney General KK Venugopal had, however, withdrawn himself from considering the grant of sanction, owing to the fact that before his appointment as AG, he had appeared on behalf of Travancore Devaswom Board supporting the bar against entry of women to the temple. Mr. Venugopal had also, in the past, appeared for Nair Service Society (NSS), which had taken an open stand against the SC judgment and has filed a review petition against it. Further, the AG had recently expressed his opinion against the majority decision and had stated that he favoured Justice Indu Malhotra’s dissenting opinion. It is understood that his withdrawal was due to these circumstances. The matter was then handed over to Solicitor General Tushar Mehta.